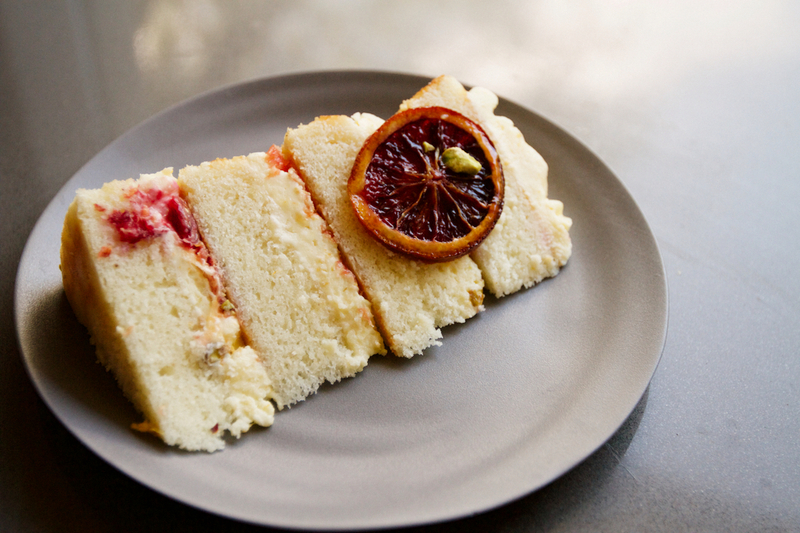 Doesn’t just looking at this blood orange cake make you bloody happy? I’ve got Aussies on the brain lately, thinking about an exciting night I had one year ago when I accompanied my friend (and favorite Australian) to the hospital while she was in labor. Allow me to quickly digress in a perfect Aussie story to go with this lovely, delicate delight. Lisa was home alone when she started going into labor. Her husband was across the pond for work when she called to let us know that she was “fine” and that she was headed to the hospital. It was 3am, so of course I headed over to her place. When I got there, she was calling for an Uber to take her to Cedar Siani. You read that right…she had just called an Uber. Anyhow, it was a very exciting night, and I will forever have the unique privilege of having been there for little Bella’s (short for Isabel) birth. So naturally, when her first birthday rolled around, I had to whip up something special. 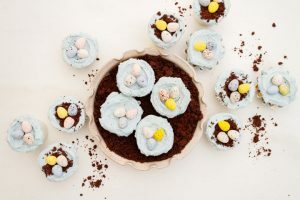 Now this cake may not seem like the kind of thing you bake up for a baby’s birthday, but let’s be honest, the first birthday isn’t for them anyway. It’s much more for the parents (high-five – you made it through the first year! ), and thinking back on that crazy, beautiful night, I just couldn’t resist this gorgeous princess of a cake. So festive and dramatic at the same time. Somehow it seemed perfect. This blood orange cake recipe is more advanced so I would encourage you to just take it step by step. If you tackle one section at a time, you will get this one right! It’s time-intensive, but loads easier if you prep a few days in advance prior to the actual assembly. 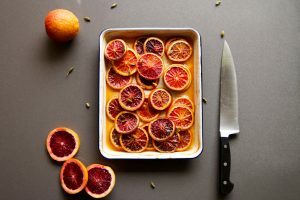 These blood oranges steal the show. Baked in honey and cardamom, this fruit smells so wonderful – it will fill your home with citrus and nutty aromatics. 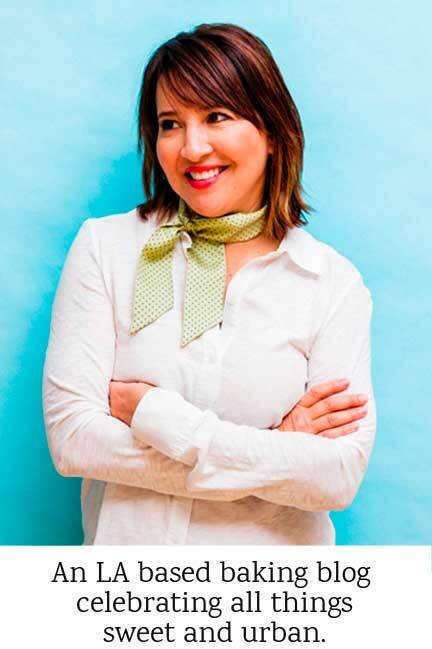 It’s a simple recipe adapted from Citrus Sweet And Savory Sun Kissed Recipes, Valerie Aikman-Smith & Victoria Pearson. 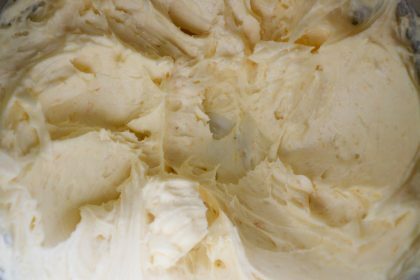 This cream cheese frosting is sinfully rich. 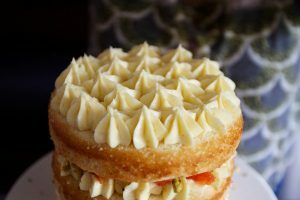 It surprises you with subtle bursts of blood orange zest that not only looks stunning, but has that ‘thing’ that makes people talk about what is inside! I might have gone a bit crazy with the zest, but I the specks. 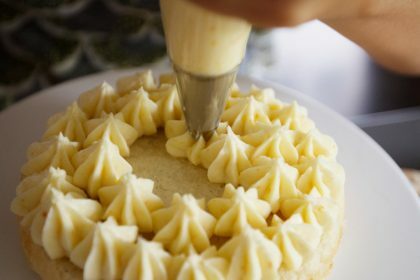 I adapted both the simple vanilla cake & cream cheese frosting recipe from the incredible Lyndel Miller of Naked Cakes: Simply Beautiful Handmade Creations. Bake your vanilla cakes (these should come complete with fresh cardamom). 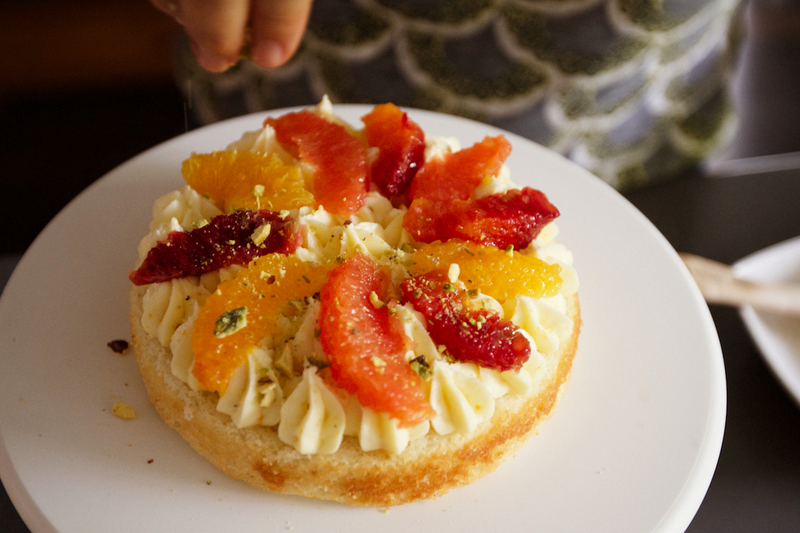 Then be sure to prep the filling: sliced blood oranges, roasted crushed pistachios, and frosting in a piping bag (or ziploc). I used a large Ateco star tip #849, but feel free to use any tip you like! And if you don’t have bags and tips, just scoop the same amount between the layers (roughly 1/2 cup) and a good ole butter knife. 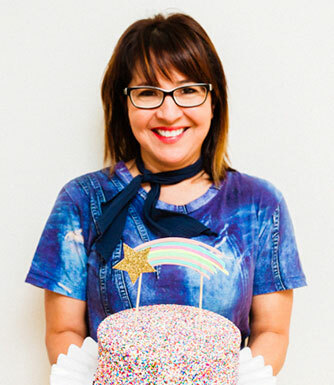 I promise you, the cake will take on a rustic beauty that will have you smiling from ear-to-ear. Start with filling the cake. 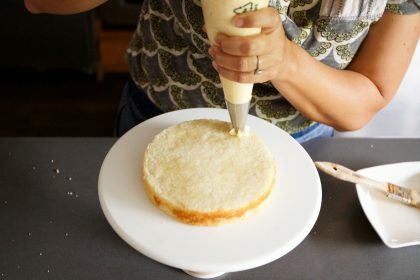 If you really want to hone your fancy-pants pastry skills, you can brush each layer with simple syrup. Then, begin your piping of the frosting. I start on the outside, leaving about a 1/4 inch between the frosting and border as the weight of each layer will ultimately push it down. 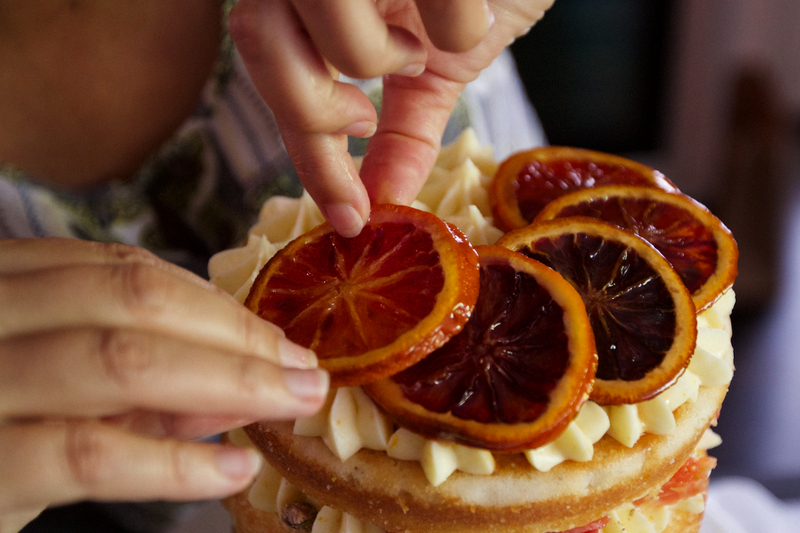 Once you have your frosting piped, begin to layer the blood orange slices. Top this with a handful of irresistible roasted pistachio, and you’re good to go. Restrain yourself, we’re not eating the goods yet! 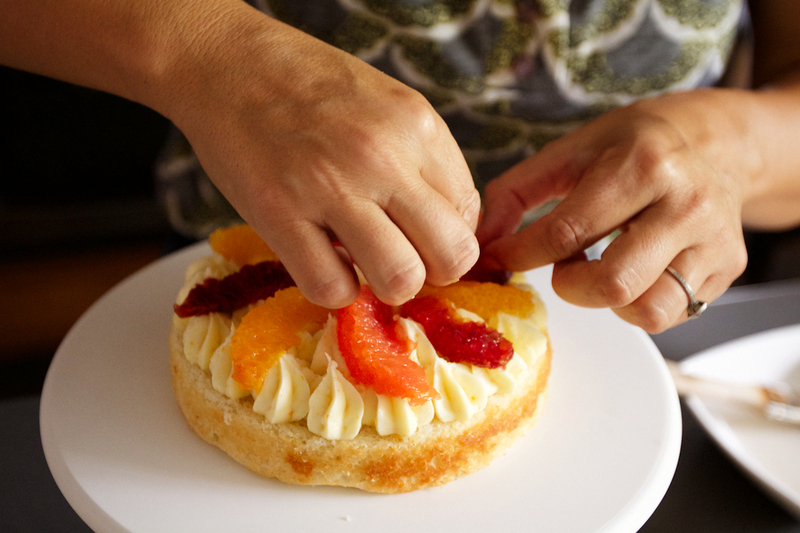 Continue by creating each layer of your cake, each with as much love and care put into the first layer of your masterpiece. This is the most satisfying part (maybe because it’s the end?). 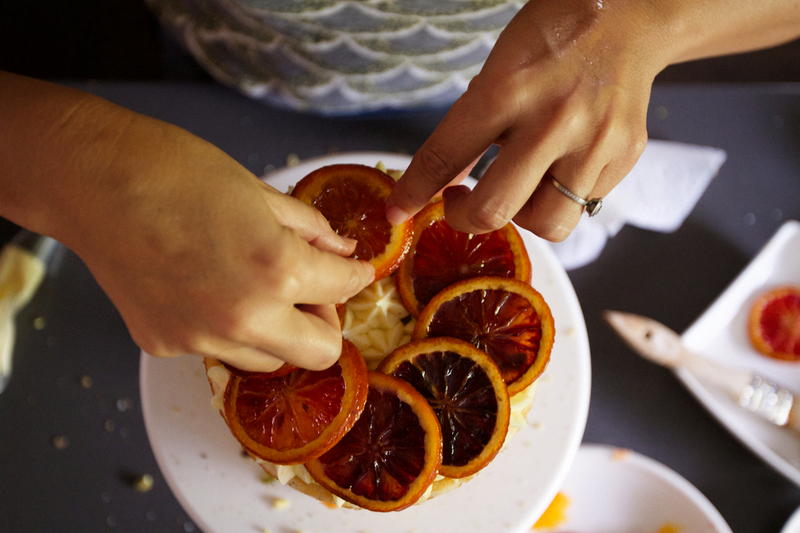 Take those lovely cylindrical blood oranges, sticky and wonderful, and begin to build them in a circle. 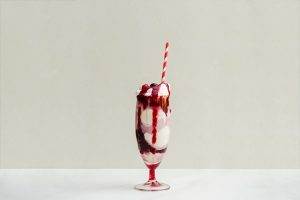 Last, top one off in the middle, sprinkle your last dash of pistachio and you are officially ready to swag into your next party with this bloody beauty! 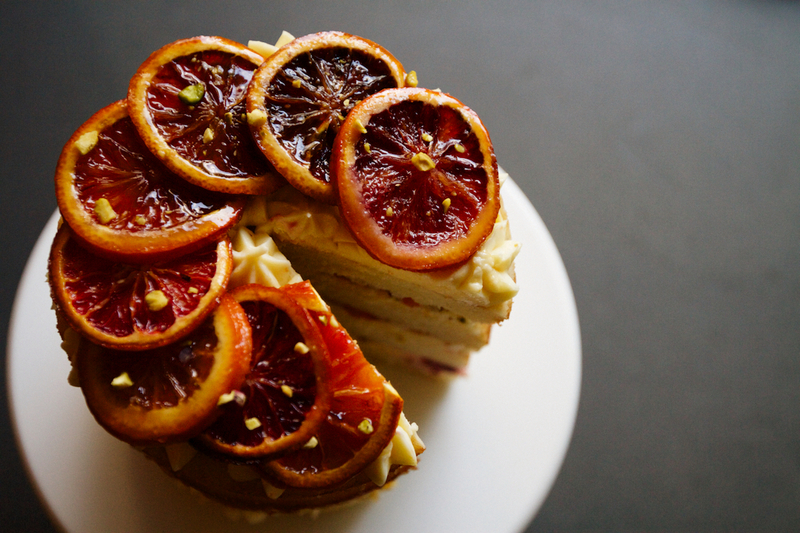 As for me, I was proud of the moment my girlfriend saw this blood orange cake. I explained my inspiration and we laughed (and cried) about that intimate, special and shared moment. If you are an Aussie out there reading this post somewhere in the ether-world, huge kisses and hugs to ya’ll. Some of the best people I know! 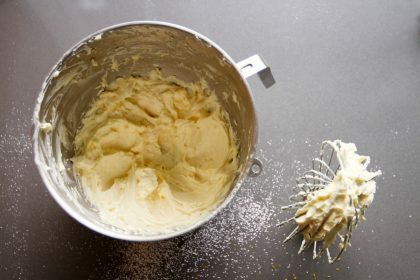 2Sift the flour, baking powder, cardamom* and salt into a large bowl and combine well with a hand-held whisk. *Take 2 whole cardamom seeds and grind in a coffee grinder. The taste will really pop in the cake. Otherwise, feel free to use ground cardamom. 1Beat all ingredients together for 3-5 minutes until light and fluffy. 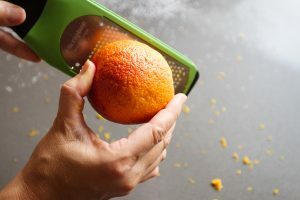 Add blood orange zest to your liking. 2Layer the orange slices in a baking dish. In a small bowl, whisk together the honey, oil, and 1/4 cup of zest, reserving any remaining zest for another use. Whisk in the orange blossom water. Pour the honey mixture evenly over the oranges. 3Roast the oranges for 45 minutes, until caramelized. Remove from the oven, sprinkle with lavender. 1Optional - Brush the cake layer with simple syrup. This helps add moistness, but also makes it slightly sweeter. 2Start with piping cream cheese frosting around the outside layer leaving about a 1/4" border. 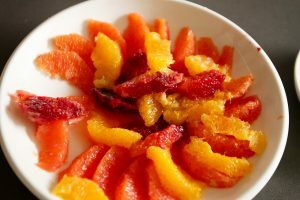 Next, in a circular fashion, lay down the blood orange slices. 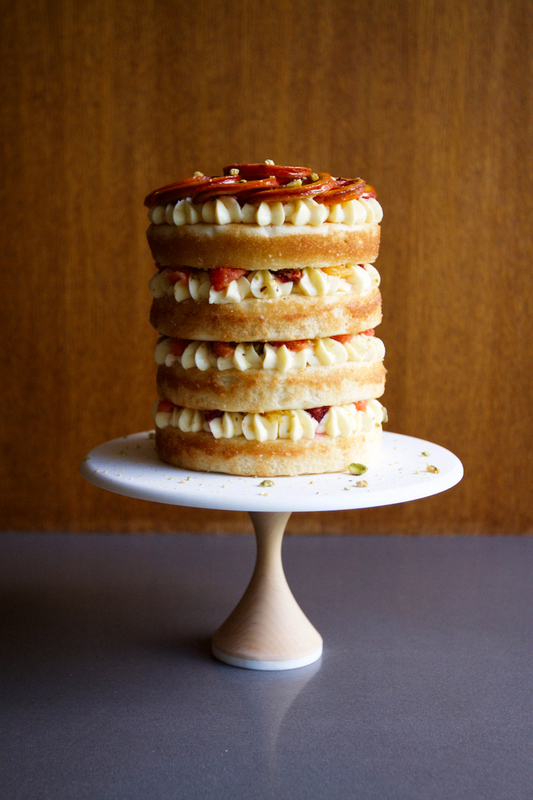 Top with pistachio. Repeat. 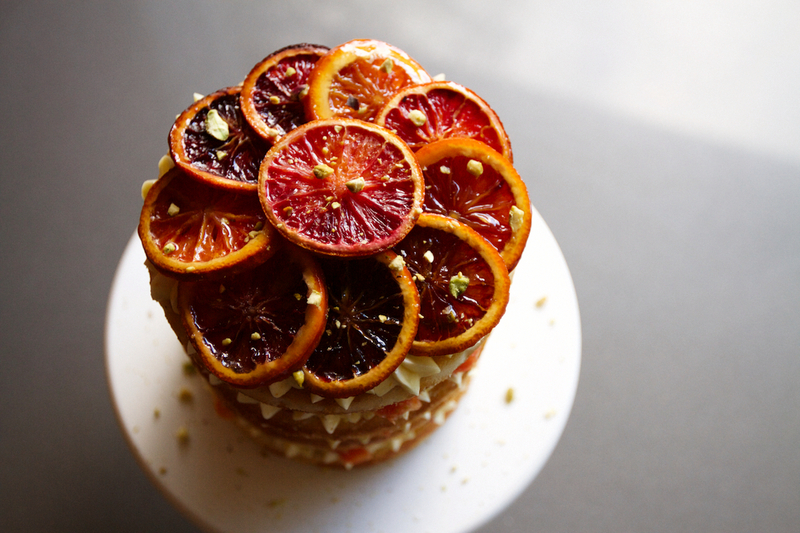 3Top Layer: Finish with honey roasted blood oranges and top with pistachio. It does indeed make me bloody happy! And how sweet that you were there for little Bella’s birth! It was pretty awesome! Love that Aussie spitfire. Glad you are bloody happy! Thanks Dawn. Yeah, the one-portion rule is a NO-GO with this one. Sort of like that Peanut Butter Nutella Banana Bread! That one is going to have me running miles and miles to burn off that anticipated binge session. Thanks Jenny! I love cardamom too. 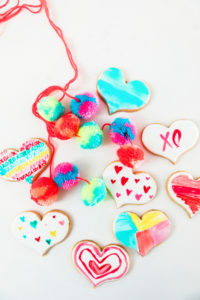 Just saw your site and it is goooorgeous. Thanks for the fine compliment. Awww shucks, thanks. We visited Australia in 2016 and it was lovely. My buddy is from Anglesea and so we visited Melbourne, Syndey, and some small beachside towns. It was perfect. Thanks for the compliment. 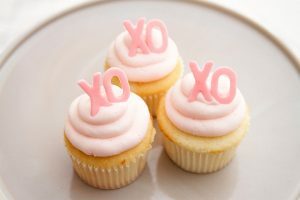 I love stories that connect to food, and what a special moment you shared! 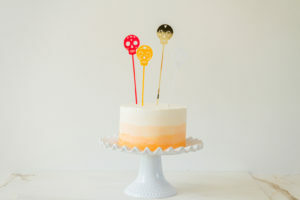 This must be one of the prettiest cakes I’ve ever seen! I’ve got blood oranges on my butcher block island… Maybe I’ll get brave. Baking is not my forte, though I can certainly do it! Stunning. Oh gosh, if I was a betting woman, I would put my money on you coming up with an awesome blood orange sauce and some type of amazing entree.